There are several nominees for what the amateur golfer would consider to be the “toughest shot” for them. Starting at the tee box and working their way to the green, there are a variety of shots that most golfers would choose as the hardest to master. The first answer that comes to mind to this “hardest” question would most likely be anything inside 50 yards to the hole, but what about shots from longer distances? Or more specifically, shots that require long distance and the ability to shape the ball? Here are some tips on how to hit long irons along with a couple of practice drills. Now, it goes without saying that most amateurs can’t even begin to demonstrate Johnson’s skill set but the statement he made has several interesting points relating to the weekend warrior improving his/her scores. The problem that most amateurs use as the reason they have switched to the hybrid is their inability to get the ball in the air. And this is a valid reason. But most of this problem relies on fundamental swing deficiencies that are easier to fix than most believe. Getting the golf ball in the air comes down to solid contact. 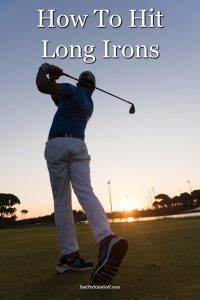 There is the misconception that a long iron, such as a 3-iron, doesn’t have enough loft to get the ball skyward. This isn’t true. An average 3-iron has anywhere from 21-to-24 degrees of loft. The irrational trap that most amateurs fall into is thinking that a 3-iron should fly high and land softly like an 8-iron. Perhaps you’ve been a spectator at a recent professional tournament and you’ve seen the pros hit 230-yard approach shots like you hit a pitching wedge. That is not the norm for 99.9% of golfers out there, but for an amateur it remains true that a solidly struck long iron will carry and fall with accuracy and precision. A drill that will help all golfers who want to add the long iron to their arsenal is one that can be easily replicated on your local range. Remember that with any iron shot it is incredibly important to have the foundation that revolves around patience and balance. A long iron club is longer than your typical wedge or lower iron. Most amateurs take the length of these clubs as a handicap and as a result, they believe that they have to swing harder and rock their weight to their back foot to swing “upward”. This simply isn’t the case and it’s a recipe for disaster, causing the swing to become out of balance and hitting shots fat. Remember, you want to first accomplish feeling solid contact with club face and ball. A great drill to execute this feeling is by taking half-swings with your long irons first. The point of the drill is that you begin to gain a sense of rhythm and the feeling of solid contact. So when you are on the range, place the ball slightly forward in your stance, just inside the heel of your outer foot. When drawing the club back you only want to go shoulder high, or roughly 60 – 70% of your normal back swing. Once you get the feeling of that position, your focus should be on moving your weight forward and cleanly striking the ball with a balanced, solid follow-through. When you finish your swing it shouldn’t be a full follow through with a club resting behind your head. You want your hips to clear, facing the target but the club should have more of a “wedge” finish about shoulder high. Think “9-to-3” on a clock face for what you want from your backswing and follow-through. What is incredibly important with this drill is that you repeat the balanced move and consistently feel that solid contact. If you have had trouble with long irons in the past, expect this “feeling” to take some time and for the drill to be repeated over several sessions. But when you have mastered solid contact and are ready for full shots, there is a simple drill that will allow you to continue to display improvement with your long iron play. On the range, place the ball on the grass where you normally would for your shot. Next place a tee in front of the ball with the distance being the length of the club head. What you want to accomplish with full shots in this drill is clean, solid contact with the ball and to strike the tee with your swing. This drill encourages the golfer to strike the ball rather than swoop at it, forcing the weight to move forward and with a natural progression. By striking the tee after the shot this assures that your club face is square through the striking of the ball. Learning how to hit long irons properly with have a big impact on your game. Remember with long irons, you shouldn’t place the ball too far forward in your stance. By placing it further than the inside of your front heel, you encourage a scooping action with your swing rather than solidly striking the golf ball. None of this is possible however if your swing is off-balance or too quick. Have confidence that the club will achieve the height and distance necessary for better shots into the green. Most of all, remember that this shot comes only with quality practice and repetition.